Posted by janina on February 20, 2011 at 9:45 pm. 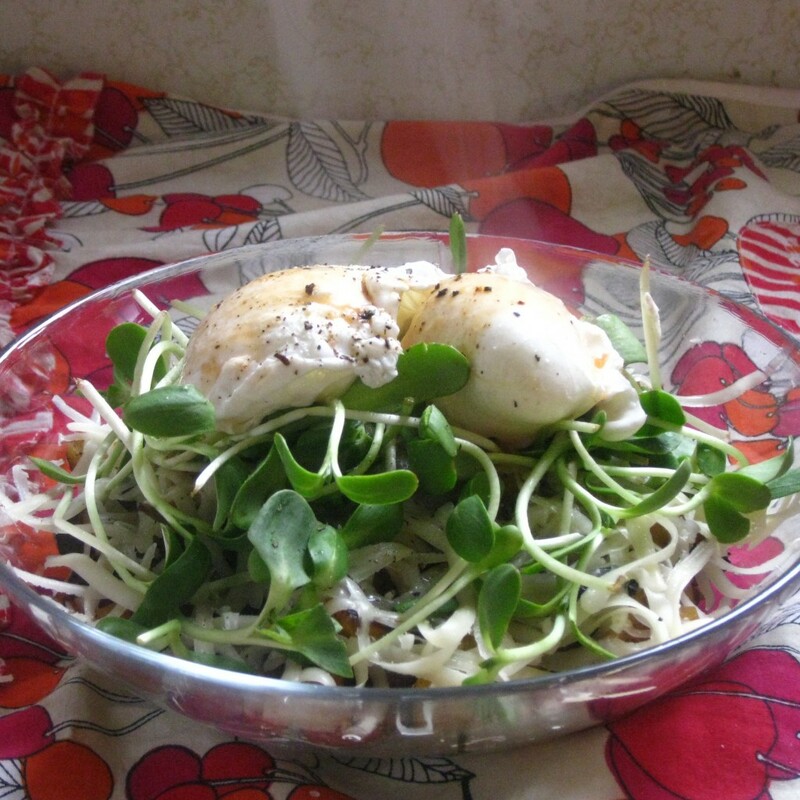 Poached eggs on a bed of sunflower sprouts, smoked mozzarella, and winter hash. I admit it’s taken me a while to figure out how awesome hash is, though it might be more accurate to say it’s taken me a while to realize I make hash a lot. Over this past winter the New York Times has brought up hash more times than I can count, and even gone so far as to link to a blog dedicated exclusively to hash. I’m always a little hesitant about food movements suspecting that the reason they are popular is not because of the inherent awesomeness of the food, but because one particular person has figured out how to do something really well and everyone wants to capitalize on their success. It happens with everything, but it is especially disappointing with food. So I ignored the buzz and continued making my basic potato hash with the occasional apple or parsnip tossed in until one day I decided to look up the definition of hash. Hash can be anything you want it to be, and it doesn’t have to have beef or ham or even potatoes in it. It is just a coarsely chopped, fried, breakfast dish usually served with eggs on top. Suddenly I was inspired and I have been experimenting with different kinds of hash ever since. The one I’ve settled on recently is a Winter Hash, made with ingredients I can get locally during the winter farmer’s market here. These are ingredients anyone should be able to during the winter, as they are all things that can be grown indoors or keep well throughout the winter. 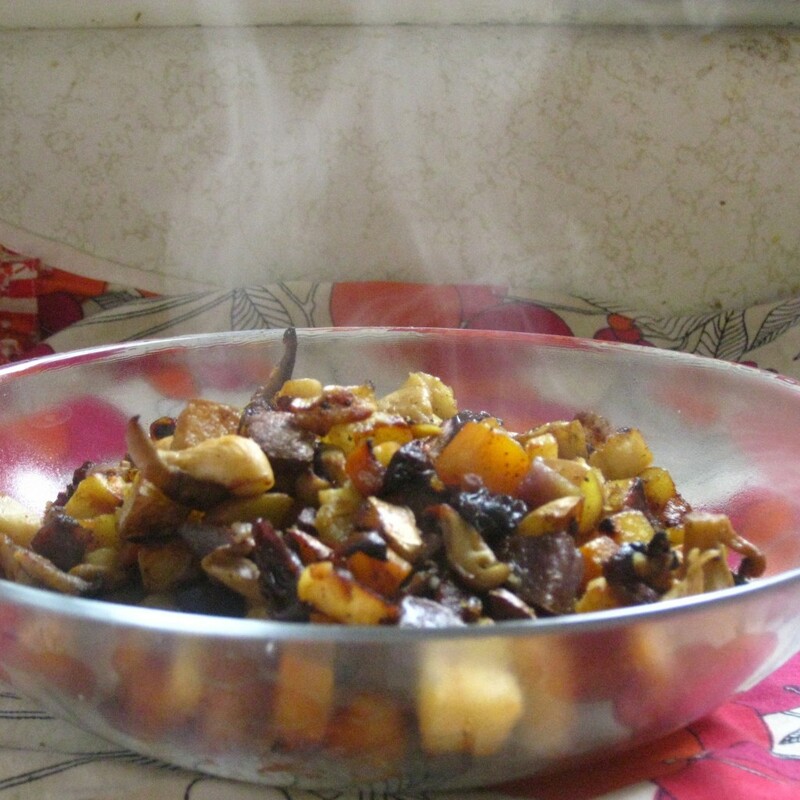 Steaming hot hash, ready for toppings. 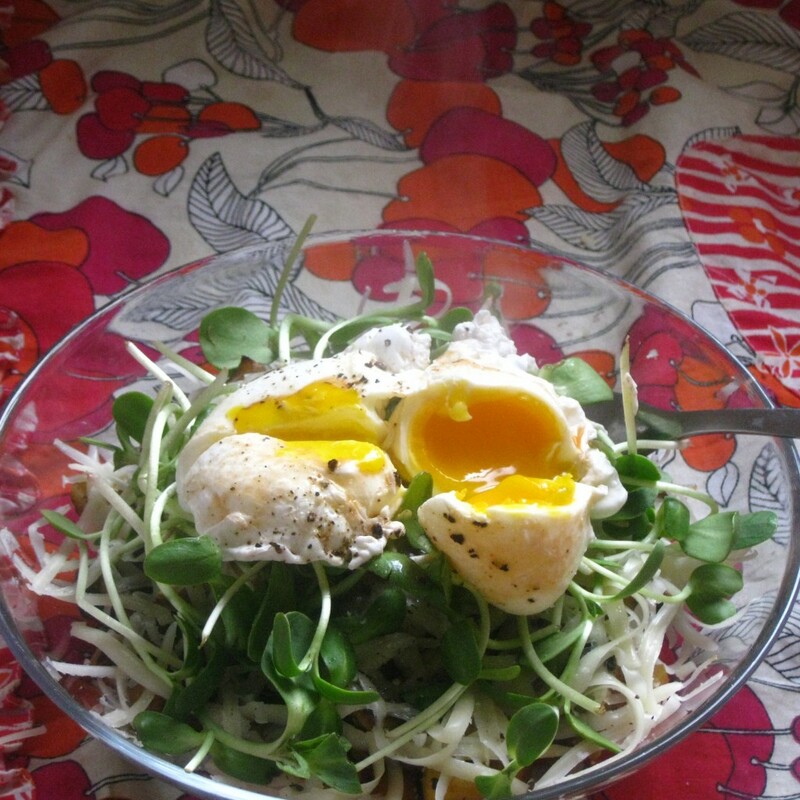 top with cheese, greens, poached eggs, and serve! NOTE: if the skillet becomes dry add small amounts of water and cover it. This will prevent sticking and help the hash cook more quickly. Make sure you add water in small amounts, waiting for it to evaporate completely before adding more. Hash topped with smoked mozzarella, sunflower sprouts, and poached eggs.